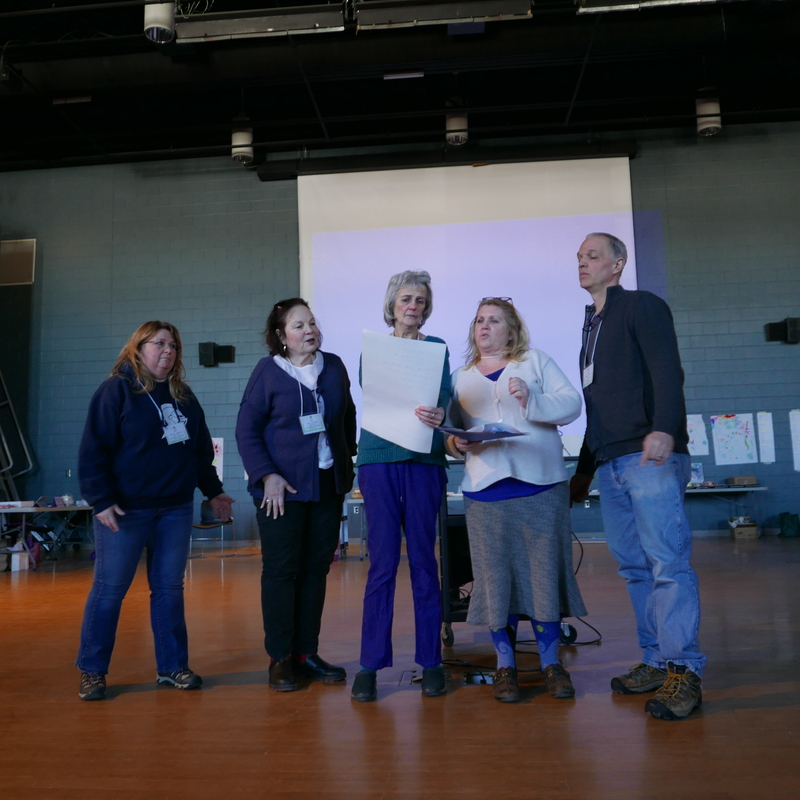 At Hampden Academy earlier this week students, teachers and families traveled from different parts of Maine to recite poetry. 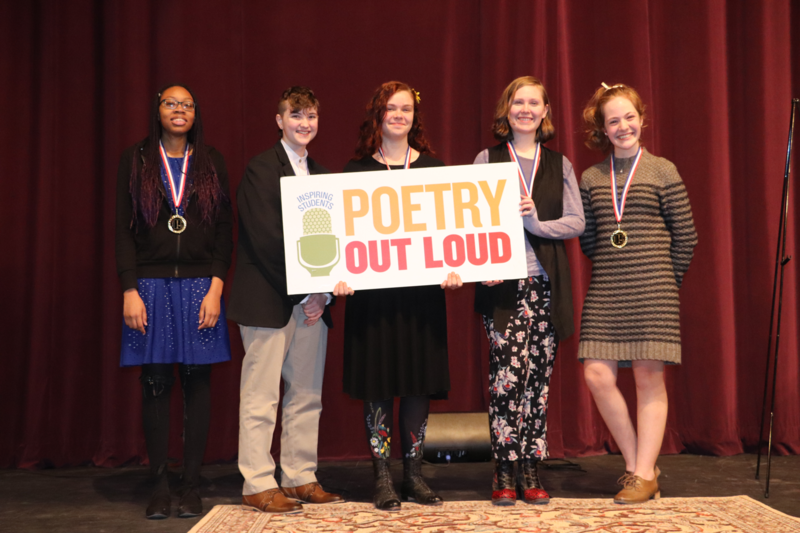 The Maine Arts Commission held the Poetry Out Loud (POL) Northern Maine Regional Finals in conjunction with the Poetry Foundation and the National Endowment for the Arts. Students have been practicing and reciting poems in schools across the state and country since early in fall. For the event they had prepared three recitations and wowed the audience with their amazing performances. We’re so proud of the following students who participated. The names with stars are the five students moving onto the state finals on March 11 at the Waterville Opera House, 3:00 p.m. The event is free and open to the public. All are welcome! The Southern Regional Finals will take place on Monday, February 11, 3:00, Westbrook Middle School Performing Arts Center. For more information about the Poetry Out Loud program please go the POL pages at the Maine Arts Commission website. 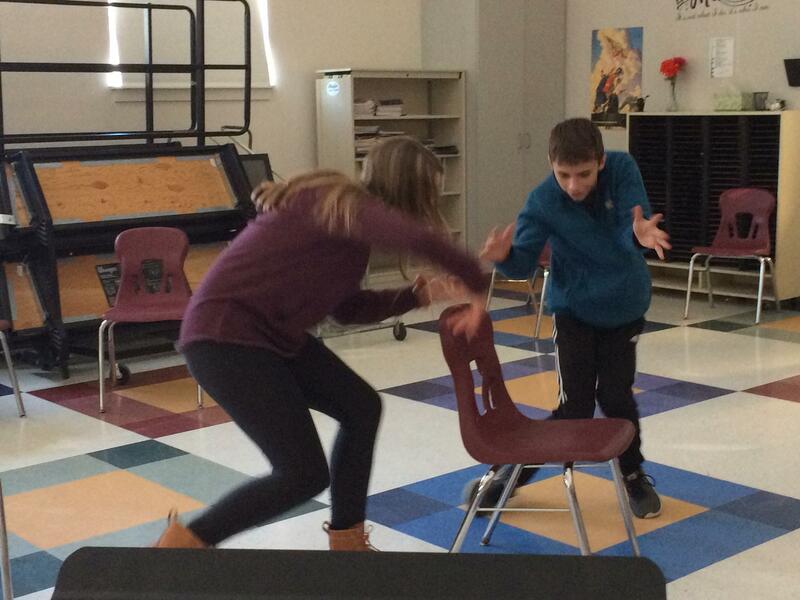 AUGUSTA-January 23, 2019—The power of dance is alive in Maine schools thanks to a Dance Education Grant offered by the Maine Arts Commission that is available to PK-12 schools and teaching artists until January 31, 2019. Applicants can apply for awards up to $2,500 to fund a dance residency in their school district. Dance education makes a difference in children’s lives and creativity. Yet only five percent of all schools in Maine offer opportunities in this artistic discipline, according to the Arts Education Census study conducted in 2016 by the Maine Arts Commission. The Dance Education Grant emphasizes high quality learning experiences for students and educators through a series of residencies that are administrated by teaching artists from the Arts Commission’s Teaching Artist Roster. Each residency is designed to teach the art of movement, performance, creative expression, and teamwork. During this past school year, the dance education grant funded residencies at Freeport High School and Maranacook Middle School. 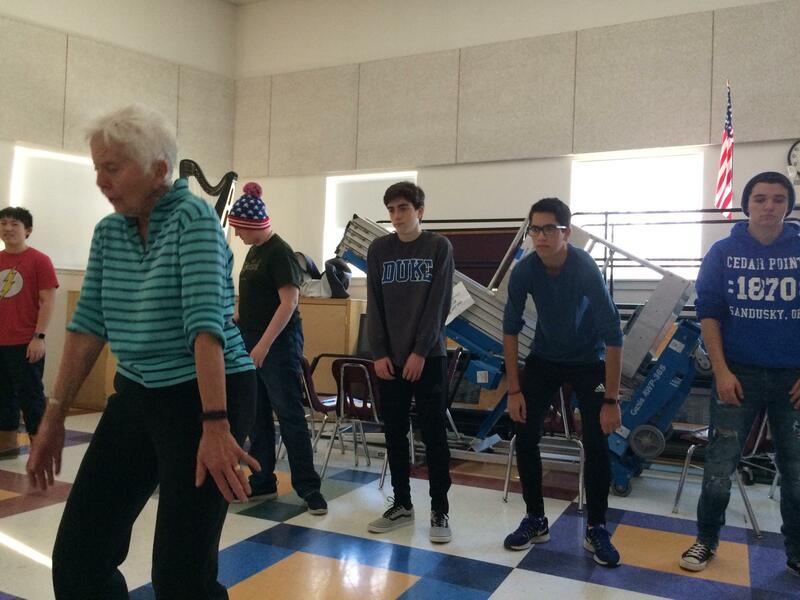 Nancy Salmon, a teaching artist listed on the Arts Commission’s teaching artist roster, provided the instruction. Applying what they learned in the dance residency program, the Freeport theater class wrote a play based on three thematic stories, and then performed the piece as an interactive workshop for all second graders in the Freeport school district. 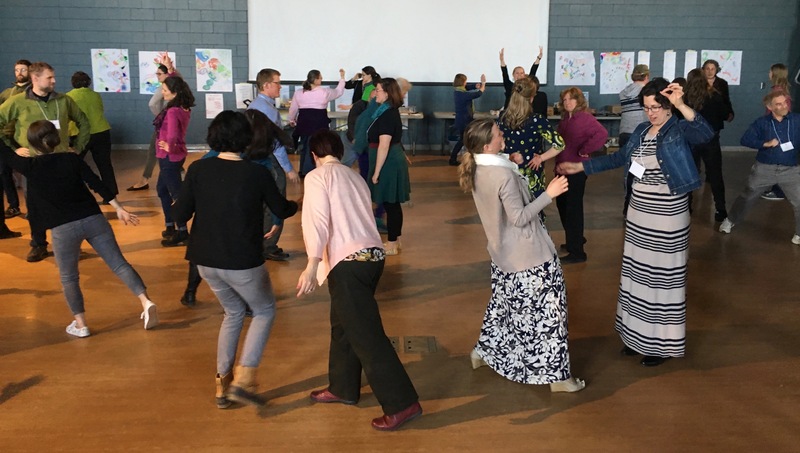 Funding for the grant is made possible through an annual dance performance presented by two schools and ten dance studios in collaboration with Thornton Academy dance educator and Maine Arts Leadership Initiative Teacher Leader Emma Arenstam Campbell. Dance Education Grant guidelines application criterion is listed at www.MaineArts.com. Applications will be accepted until Thursday, January 31, 2019.The Commission encourages PK-12 educators or teaching artists to review the guidelines prior to applying. The funding cycle for the grant must take place September 1, 2019 through March 30, 2020. The Way We Move social circus brings the circus arts back to Portland. 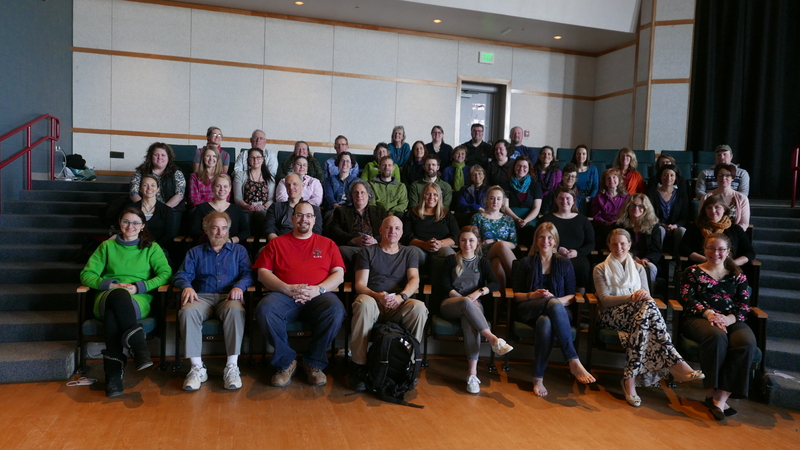 Mechanics Hall in Portland will host a special fundraiser for a new Portland-based nonprofit on March 27th. The Way We Move is a social circus program working to bring the circus arts to children, adults, and kids of all ages who may otherwise not have access to circus arts. The fundraiser on March 27th from 6-9 p.m. will be the official debut of the organization as a nonprofit after obtaining their 501c3 status in the fall of 2018. Scheduled performers for March 27th include: The Hadacol Bouncers, Michael Trautman, and Amelia Aglow, plus stilt walkers and other circus performers will entertain the crowd. The event will include appetizers, drinks, and a silent auction with all proceeds helping to provide low-cost and sliding fee circus programs. Tickets are $60 per person and can be purchased in advanced on the WayWeMove website. Sarah Keener taught language arts for several years and has worked with children of all ages in the areas of literacy and art. A lifelong lover of books and of arts and crafts, she believes language and the arts are a natural fit and draws from a variety of digital and print resources to implement effective and engaging activities. Sarah seeks to create opportunities for kids to explore these disciplines in a positive and playful environment, which helps them grow more confident and excited about expressing themselves in words and a variety of mediums. Workshops cost $35 each or $10 for scholarship recipients. Workshops are currently presented for two age groups: 10 am – Noon for children ages 6 – 8 and 1:00 pm – 3:00 pm for children ages 9 and Up. 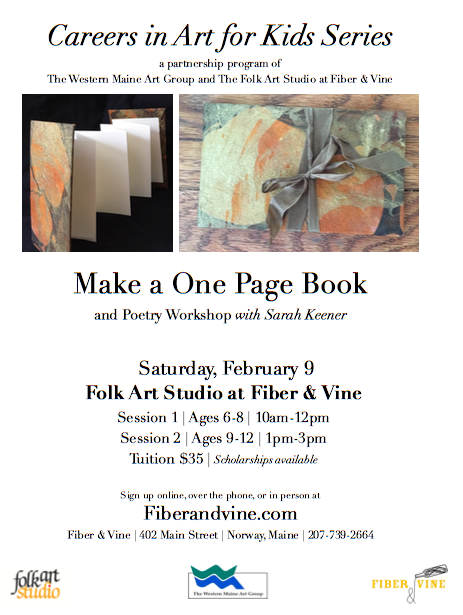 For information, scholarship requests and registrations, contact fiberandvine.com or call 207-739-2664. All workshops are held at The Folk Art Studio@Fiber & Vine, 401 Main Street, Norway, Maine, 04268. 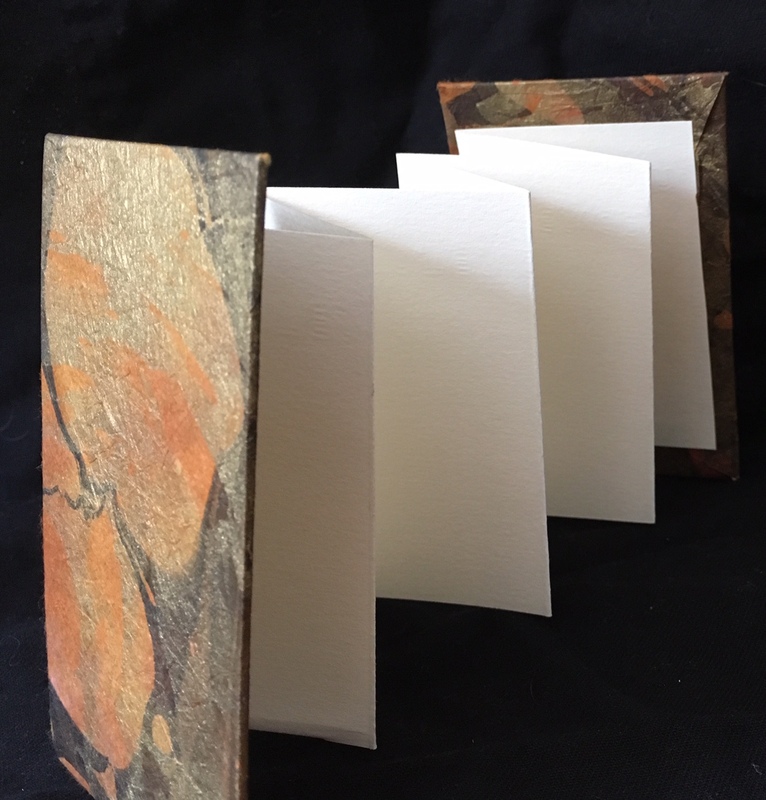 This workshop series is designed to expose children to the myriad of processes and professions for visual artists (illustration, design, fiber arts, literacy and making books, visualizing nature and science, architecture, etc.) The series aims to open pathways for kids to consider making as a worthwhile activity and even imagine a dream that becomes a viable profession one day. It has been evidenced that activity in all of the arts fosters creativity and increases a childs’ learning capacity for all subjects. The Western Maine Art Group (WMAG), The Folk Art Studio and Fiber & Vine have partnered to bring this workshop series to the Oxford Hills. Through a generous grant from The Norway Savings Bank, Oxford Credit Union and the Rotary Club, scholarships are offered for those with financial need. The Performing and Media Arts Director will be responsible for providing leadership and oversight in planning, development and implementation of media and performance arts programs and projects; regularly surveying and meeting with leaders and artists in the media and performing arts field. • Identify, document, communicate and respond to current needs for each sector. • Direct, organize and curate ongoing programming to benefit the Media and Performing Arts fields, including but not limited, to cultural tourism initiatives such as the Maine-New Brunswick Partnership. • Developing and initiating programs and projects to benefit the media and performing arts field and meeting the goals outlined in the cultural plan. • Acting as an information resource, both internally and externally, which requires consistent monitoring of the national trends. • Curate, organize and direct ongoing agency programs. • Direct and manage logistics for bi-annual Maine International Conference on the Arts, in addition to other events and forums. • Assist with the implementation of ArtsEngageME as needed and as directed. • Knowledge of principles and practices of public administration and financial management. • Knowledge of state and federal grant management laws, rules, and regulations. • Knowledge of theories and practices of community, business, and/or resource development planning and program implementation. • Knowledge of government mechanisms, capabilities, and constraints. • Ability to write clearly and effectively. • Ability to deal effectively with a variety of people representing a diversity of interests. • Ability to direct and oversee professional and clerical staff. A six (6) year combination of experience, education, and training of a progressively responsible nature in financial, public, business, and/or resource management to include supervisory experience. Preference will be given to applicants who possess a BA in Performing Arts, Arts Administration or related field, in addition to having a minimum of 5 years work experience. Please visit https://www.maine.gov/fps/opportunities/ where you will find the posting for this position. Click “apply now” and upload both your resume’ and cover letter. Parent energy and initiative often bring teaching artists to schools to conduct workshops that supplement and support school arts programs. When invitations to those workshops extend to the community as well, an interesting community/school arts link can be created. When the number of workshops reaches a grand scale and the invitation outreach is statewide, something truly newsworthy takes place. Lights, Camera, Action (LCA) has taken place during the last two years at Nokomis Regional High School in Newport. 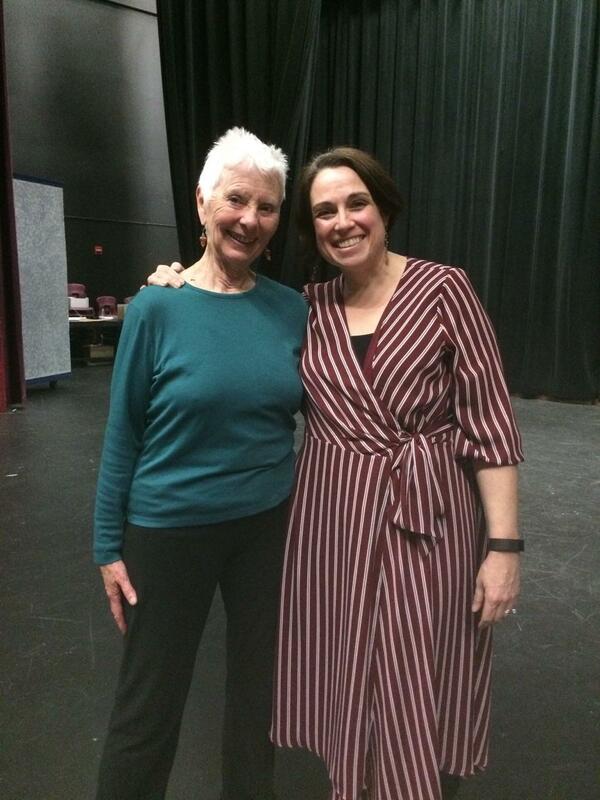 Parent, Gretchen Gehrke, was inspired by a program at MIT and by the commitment of Nokomis theater teacher Lisa Neal. 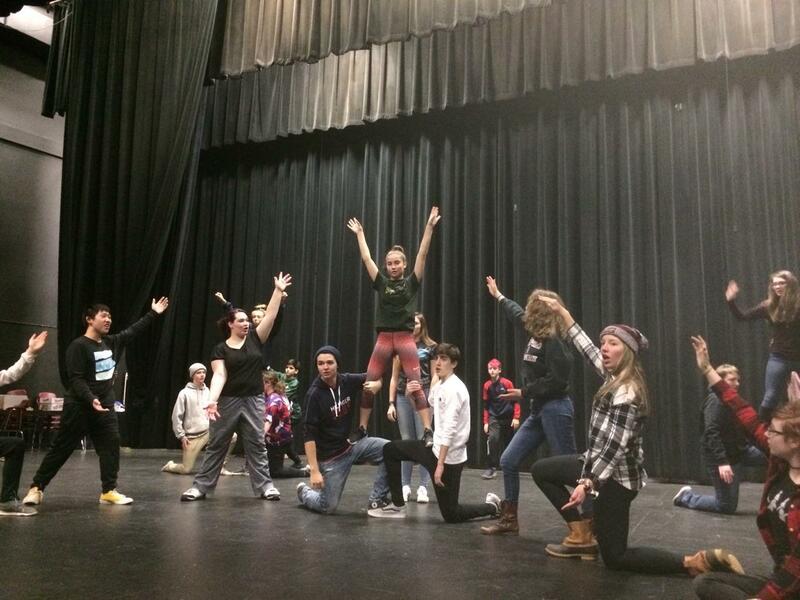 “Nokomis – Lights, Camera, Action!” was created in partnership with the school’s theater program. This program is designed for students in grades K-12. Actors, Artists, Authors, Athletes, Chefs and Musicians, share a full day of workshops, rehearsals, and performance. Students K-12 are welcomed and taught by qualified and enthusiastic instructors on a wide variety of fun topics. 2018 included over 50 workshop choices. Workshops are offered for students in K-3 and the cost is $25. Workshops for students in grades 4-12 with a cost of $50. The cost includes all activities, a t-shirt, costume and meals. Scholarships are available. A full day of workshops on Thursday, February 21, Nokomis Regional High School. The culminating program will take place during the evening starting at 6:30: “Closing Act” demonstrating some of the days accomplishments. Workshop information is located at https://www.nokomislightscameraction.com/students/2019-workshops/. Register at https://www.nokomislightscameraction.com Questions, email friends@nokomislightscameraction.com. 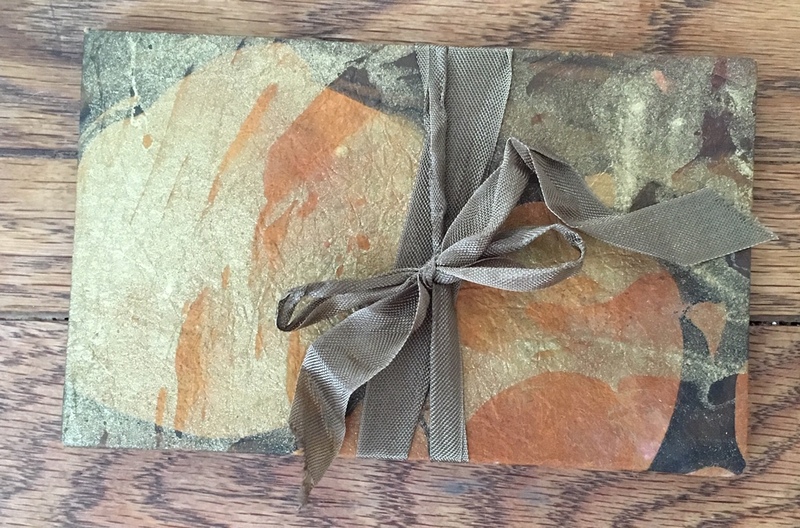 You are currently browsing the me arts ed blog archives for January, 2019.